Green beans are always a welcome addition to a meal in my house. I can always depend on them being a dish that everyone enjoys. 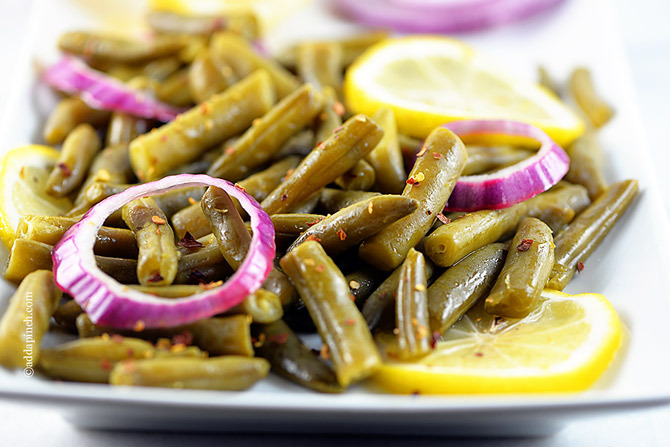 These Spring Green Beans are a delicious way to welcome spring with a light, fresh side dish that the whole family will love. 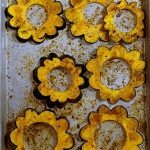 I love planning spring meals, especially with all of the beautiful side dishes. Whether they are simple weeknight meals for my family or a more elaborate spread when we are entertaining friends or for our family Easter celebration, planning a meal in the spring just seems so bright with possibilities. Maybe it is because the weather promises to warm a bit and the afternoons are brighter as they days get longer. 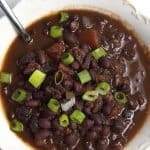 It may also be that after all the heavy, comforting meals of fall and winter, my body just knows it is time to lighten and brighten up a bit. 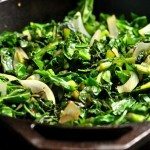 I do love to include healthy side dishes that everyone will enjoy when I’m planning our menu, like this spring green beans recipe. Bright, beautiful and so full of flavor, you’d never guess how easy it is to prepare. In just a few minutes, you have this delicious dish that definitely pleases the eye as much as it does the palate. That’s probably one of my favorite tips about planning dishes for any menu, make sure it is just as beautiful as it is delicious. 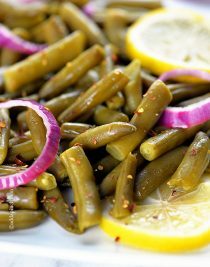 For these spring green beans, I used just a few ingredients yet created a dish with loads of flavor. The star ingredient, of course, is green beans. I drained and quickly sauteed them with a touch of olive oil and then tossed in thin slices of red onion. 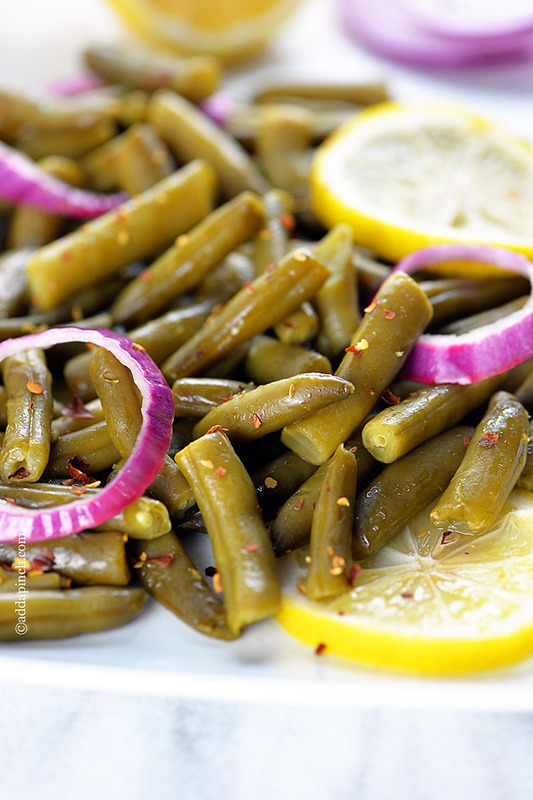 For serving, I squeezed a lemon over top of the green beans, added in a few fresh slices of lemon, a sprinkle of red pepper flakes and voila, this simple side dish was ready to be devoured. While this recipe would be delicious served alongside a weeknight meal of fish or grilled chicken, I knew it would be perfect as part of a special spring meal, like Easter, with a simple roast chicken, my Mama’s squash recipe, classic deviled eggs, and a few other classic, yet simple favorites. 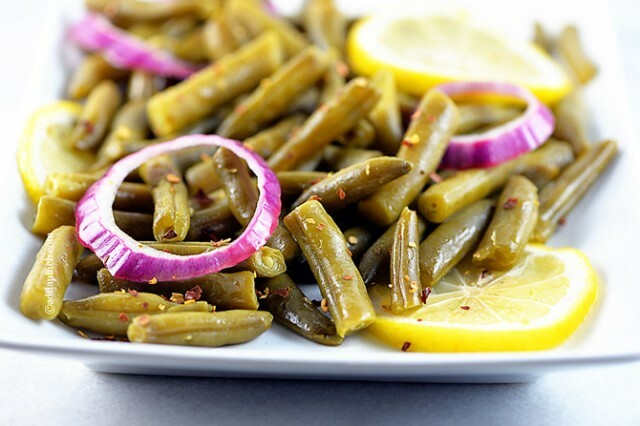 Here’s my Spring Green Beans recipe followed by a menu plan perfect for your special spring supper you may have in the works. 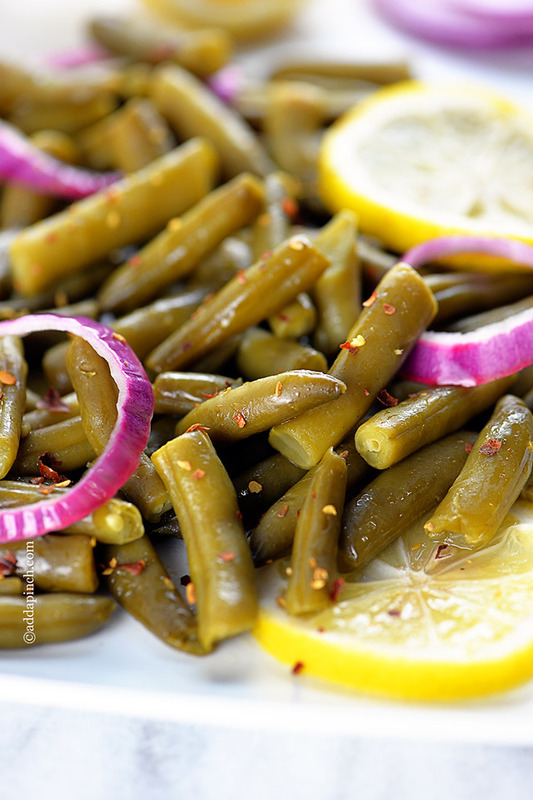 These Spring Green Beans are a delicious way to welcome spring with a light, fresh side dish that the whole family will love. Heat skillet over medium - low heat. Add green beans and drizzle with olive oil. Quickly saute green beans, about 3 minutes. Add in rings from slices of red onion. Remove from heat and squeeze juice from one half of lemon. Cut remaining half of lemon into thin slices and add to the green beans. Sprinkle with red pepper flakes and serve. I’m excited to make all sorts of chilled salads, sides and desserts this spring. I like making pasta and potato salad to eat with cold sandwiches and pickles. 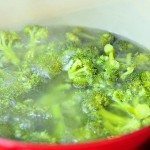 I’m interested in making the Spring Green Beans recipe. I love onion and using lemon in dishes. 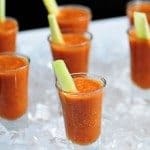 It sounds refreshing but I might skip or go lighter on the red pepper flakes. I am looking forward to making strawberry shortcake, I can’t wait until the local berries are ripe. I look forward to making strawberry-rhubarb pie and grilled asparagus. I am incredibly excited to try a range of recipes involving fruit especially lemons! I found some fantastic ones during the week for pound cake, lemon sponge, scones, bakewell tart and a trifle. 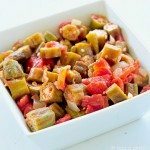 I am most excited to make my Green Bean, Sausage and potato Stew. I’m excited to make fruit salad. I’m looking forward to making an avocado and quinoa salad. I love making my pasta salad for picnics. I like pasta salad and potato salad at this time of year. I like roasting fresh asparagus in the spring. I would have to go with anything BBQ’ed!! I can’t wait to make summer coleslaw !! I’m excited to make pasta salad! I am looking toward to making my favorite stir fry with eggplant, tofu, red peppers, onions, garlic and lots of spices. I am excited to grill some steaks. These recipes look amazing and the cauliflower is right up my alley since I’m a big Cauliflower lover.